EliteSingles is open to singles from 18+, but their user base is largely between 30-55. They also attract a more educated, professional crowd, with around 82% of their members holding an academic degree. The gender ratio leans slightly more towards women than men, with 57% female members to 43% male. EliteSingles have a worldwide presence, with members in over 20 countries around the globe. They are also one of the most popular and fastest growing online dating sites. They boast 18,000 new members every single week, and more than 13 million singles have already taken their famous personality test. The site caters to both gay and straight singles, which helps them stand apart from other popular compatibility sites. They enjoy around 300,000 visitors each month, which means you’re never short of singles to match with. Because of the nature of the compatibility test and the older than average demographic, most singles using the site are looking for long-term commitment and marriage rather than casual dating or hook-ups. EliteSingles believes in core compatibility based on personality, so the signup process is an investment of time and honesty. Users should set aside at least half an hour to work their way through the quiz. Initially, a user simply needs to enter their gender, the gender they are interested in, and their email address. They will then be prompted to begin the signup process. The option to save and continue later exists at any point, but avoiding the quiz is impossible. Many of the questions use a sliding scale from ‘doesn’t apply’ to ‘completely applicable’. 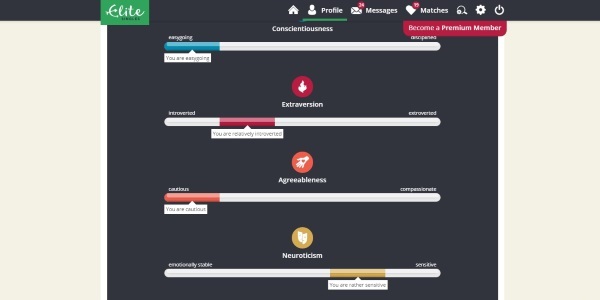 This is used to rate how a user views their appearance and personality, be it physical, for example trendiness, or more in depth, such as sensitivity. Users will be prompted to enter their religion, and what religious expectations they have of a partner, for example if a shared faith or cultural background is essential. The idea of the quiz is to really get to grips with who the people joining the site are and what they are looking for in a match. Therefore, some of the questions might seem personal, or require a little more thought. Below are a few examples of what users can expect. Can you keep calm in a stressful situation? Do you believe in monogamy in a relationship? Do you try to make sure other people feel good? Do you have a strong moral code? These are just some of the things users will be asked to think about. Upon completing the quiz, singles will need to choose four words which their own friends might use when describing them. This helps the site uncover the image that singles are giving off to their closest friends, and how they like to be seen by others. The final section of the sign up process involves thinking about the hobbies singles want their prospective partner to enjoy. These range from travel and cookery, to spending time with family and friends. The final section covers drinking and smoking habits, and children. All of these elements help EliteSingles create a powerful algorithm which really works to match like-minded singles. EliteSingles is all about doing the hard work behind the scenes, not leaving it up to the singles. Once the sign-up is complete, users can sit back, relax and wait for the matches to arrive on screen. Every day all members will receive between 3-7 matches to both their home page and email inbox. 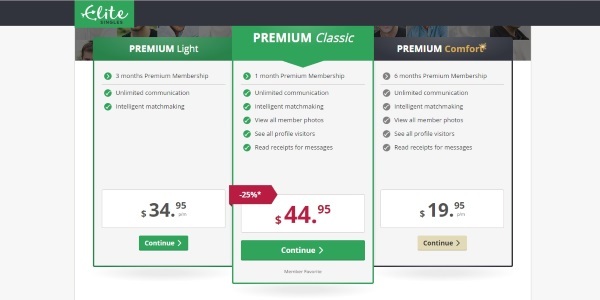 Premium membership unlocks up to 20 more daily Wildcard matches. These are chosen based on an extensive matching algorithm which is based on the key elements of a user’s personality. 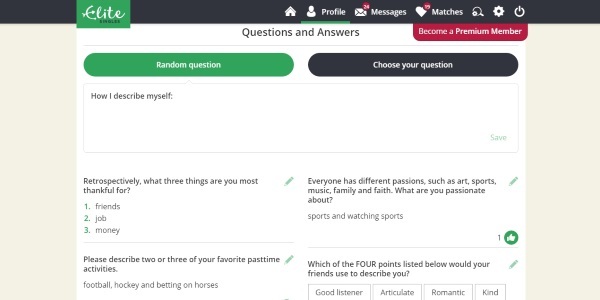 The personality quiz results can also be seen from the profile tab. Psychology has shown that the 5 key factors EliteSingles looks at are the personality traits which with the right balance between partners, have been proven to create a long-lasting relationship. The EliteSingles dating profile is the hub of the activity on the site. As well as personality test results, users can include information about themselves, their interests and hobbies. EliteSingles even has expert profile advice available if singles need a bit of support standing out from the crowd or crafting a strong profile. It’s essential to take the time to upload photos as they significantly improve the chance of getting contacted. Members can either take them directly by camera, upload from a computer or phone, or even take photos instantly from a synced Facebook account. EliteSingles lets members upload up to 24 photos to their profile, which gives plenty of opportunity to show various sides of their personality. While singles aren’t forced to upload any photos at all, EliteSingles does note that profiles with at least one good quality image attached are 8 times more likely to be contacted. Matches can be narrowed down with the help of some simple search filters. While these don’t include the ability to amend the personality quiz once it’s been taken, some parts of the search can be altered, such as distance, age, lifestyle habits or physical appearance. The manual search helps hone the right results for singles who like to actively look for matches in addition to having them arrive to their inbox. The fun and addictive Have You Met game introduces users to new singles who might not have appeared in daily matches. Sometimes this even introduces two singles who may never have met one another through the scientific algorithm alone. After all, opposites attract! At a glance, users will be able to see who has looked at their profile, who has added them to favorites, and which singles they themselves have favorited. In terms of dating on the go, EliteSingles has powerful and intuitive mobile apps for both iOS and Android devices. These let users check and respond to messages, upload photos and keep track of interactions all from a handheld or mobile device. How User Friendly is EliteSingles? Thanks to EliteSingles’ clear layout and step-by-step sign up process, there is unlikely to be any problems for less tech-savvy users or more mature singles. However, if any errors are made on sign up, users are immediately prompted to fix them with the help of pop-ups or tutorials. All the elements of the site are easy to find with the toolbar on the desktop, and via mobile app with the left hand toolbar. Another area that contributes to making the site user-friendly is the matching process. The scientific algorithm that is based on the test results generates potential matches and allows singles to just sit back and let EliteSingles do the hard work. Those who wish to be more active, can use the manual search and narrow down the results with various filters. The only element to consider is the lengthy sign-up process. 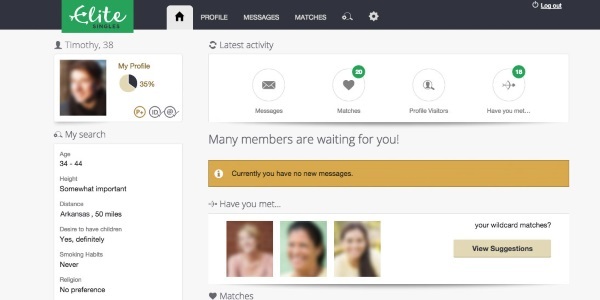 If users are looking to be signed up and browsing singles within a few minutes, EliteSingles is not the ideal choice. Safety – Does it Come First? Security is essential online, especially when it comes to online dating, and EliteSingles takes safety very seriously. The manual verification of profiles and photos is one important step which ensures no scam artists are allowed into the site. In addition, the site employs software which ensures no photos can be copied or downloaded either. All data is protected with SSL security, the most trusted and secure layer of encryption possible. The small lock icon on the URL is a sign that members can feel confident entering financial information. Another noteworthy aspect is the “https” which shows that the site has strong security on every page of the site. EliteSingles has a dedicated fraud team in place which makes keeping the site safe and secure its top priority. Premium members can take advantage of ID authentication which gives an added layer of security when talking to new people. The EliteSingles help center makes it incredibly simple to find answers to the vast majority of customer queries and concerns. The search bar is responsive and powerful, and gives the option to look for articles and support via keyword. In case members can’t find the answers they need and are looking for further assistance, they can get in touch with customer care 24 hours a day. The best way to do this is via the contact us form from the help center, but users can also send a fax or even a letter. The customer support team is based in Germany which means that their response hours will be between 9-6 GMT+1. It might be helpful to check the time difference for a specific location in order that replies can be anticipated accurately. The team replies to every single message, and promises to guide members through any issues using the site and the mobile app, including directing them to the right member of staff or department for their specific enquiry. EliteSingles matches 2,500 happy singles with their ideal match every single month. This strong statistic should make users feel confident they are making a good choice. Since they match singles based on personality with their own powerful algorithm, EliteSingles’ success rate is much stronger than other dating sites. Additionally, they provide a service singles could not do for themselves, using science and maths to find the most compatible match. The site caters mainly to singles who have a university degree, work in a professional environment and are aged between 30 and 55. This means they have more a niche vibe and help a specific kind of people meet like-minded singles who they may be struggling to find offline. EliteSingles is the perfect dating choice for professional singles between the ages of 30-55 looking to settle down, and find love and marriage. The personality quiz successfully helps 2,500 singles find love every month. The security tools are second to none, and the site stays ahead of the game by merging with social media and providing easy to use and gorgeously designed mobile apps for both iOS and Android. Are you looking for a dating site which matches you on your personality and will help you find long-term commitment without the hard work of trawling through endless profiles? You’re ready to try EliteSingles and discover what core compatibility really means.